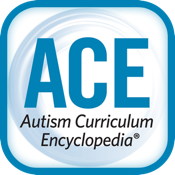 The ACE Data Entry app is a fast and easy way to record student performance data on all programs within the Autism Curriculum Encyclopedia (ACE). The ACE is the premier educational system for learners with autism. This online package provides BCBAs and Special Educators the ability to assess, teach, and evaluate progress using evidence based procedures. Log in to your school, find your students, choose a lesson, and begin teaching. With the free ACE Data Entry app, existing ACE users can collect data and sync the results immediately to the student’s ACE folder!